Australian Chief judge Peter Kidd sentences former Bishop of Sydney and Vatican insider Cardinal George Pell to six years in prison, for the sexual abuse of two boys in the 1990s. 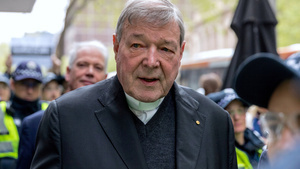 Pell was convicted last month on five charges of child sexual assault, following a committal hearing, a mistrial and a trial. He has lodged an appeal, which will be heard in June. 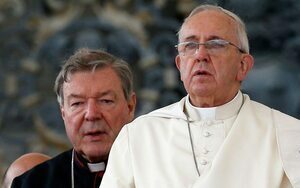 Pell, who was until recently the third most powerful Catholic in the world, will serve a minimum of at least three years and eight months in prison. Yesterday: Did You Like It? Posted in Misc and tagged George Pell, Vatican at 9:06 am on March 13, 2019 by Bodger. I wonder what the Michael Jackson apologists have to say about this? There are quite a few big commentators in Australia railing against Pell being found guilty. They say he was found guilty only because of peoples bias against the church. This is even though his own counsel asked for a light sentence as his abuse of a 13-year-old choirboy was just “vanilla sexual penetration”. That “asking for a light sentence”, using colourful and innapropriate language (for which the lawyer has apologised) is entirely standard and NOT an admission of guilt. It is recognition that the verdict was guilty and then trying to get the minimum sentence for a client. 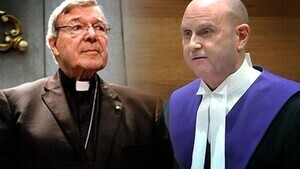 It’s not an admission of guilt, clearly, because Pell has appealed the verdict, as is his right. On the broader point of the accusers testimony, it’s worth noting that he did not give testimony a second time at the second trial. They just played a recording of the previous trial. This is reasonable from the point of view of not asking him to go through the ordeal of testifying again. But it does beg the question, how come a previous jury could not say Pell was guilty, yet with the same testimony, a second jury could?